Merry Christmas!! ( a few days late) I hope you all had a wonderful holiday with your families. We had a great one and I’ve spent a good few days doing absolutely nothing but enjoying being home. Before Christmas I noticed I was down to 1 skirt that fit, so I made myself another one with a nice stretchy waistband I can wear while I grow wider and wider and wider and wider and wider. Yay. The fabric was at Joann’s on sale, the whole skirt cost me under 10 bucks. The ruffle at the bottom was a last minute addition when I accidentally chopped it off too short. ( long skirt + no nylons = happy me) I made the ruffle by sewing with a large stitch length and holding the spool of thread on my machine to increase the tension. I wore this to church today and I’m happy to say I loved it, and it was still loose enough it didn’t cut off circulation to my legs for 3 hours while sitting in church like last week. Oh the joys of pregnancy. The skirt is cute- and so is your baby belly!! :) That boy is a growin'!! LOVE the skirt! Did you make up the pattern? That ruffle is the perfect detail! 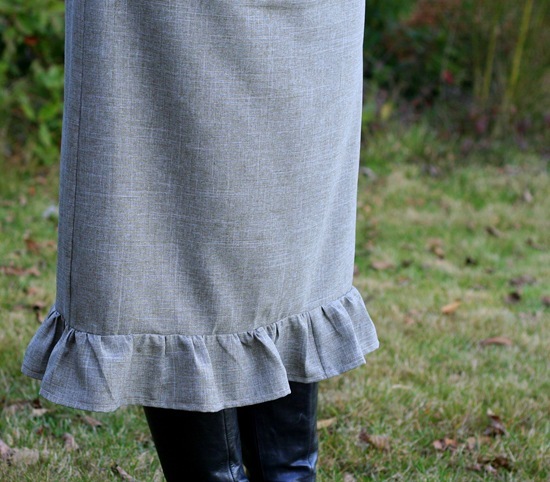 I love the straight skirt with the ruffle! You gotta love those accidents that turn out great. 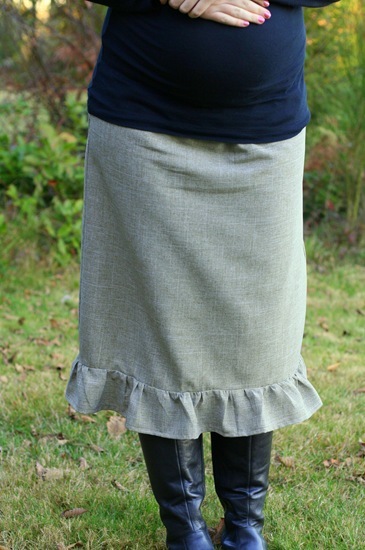 LOVING this belly shot – and this skirt is super cute + about $10?? If only I knew how to turn on my sewing maching! ;). Glad y'all had such a great Christmas!! Tell everyone hi for us & give Ben our congrats!! Adorable + Comfy= happy woman! I like the bump above the ruffle much better! LOL I'm reliving my pregnancies vicariously through you…you know. Cute skirt. Love gray. Cute belly, good excuse to eat all the cookies! Very cute! And, happy baby! I wonder how many women from our swap had babies or were pregnant during the last year! Your belly looks so cute :-) Very nice skirt. what a cute skirt! did you follow a pattern or make it up? I think your blog looks great! I love the skirt! So glad to have found you. Happy New Year! Oh!Your skirt is adorable….but ur baby-bump is even cuter! this is so cute! hopefully you can wear it after the baby's born. Is this a t-shirt banded skirt? Would like to make one for my pregnant daughter-in-law.